We've ordered 35 baby chicks from Cackle Hatchery , at Lebanon, Mo. I'm trying not to get impatient, but I really looking forward to having chickens again! We haven't received a shipment date yet, but I already have a brood box set up , and have tested the heat lamp. I'm expecting 20 Dominique, and 15 Brown Leghorns. Hurry up Cackle Hatchery and send my chicks! Wish I had the room for a few chickens, but I live in the city and have a lot of garden that takes up most of my back yard. Once my youngest finishes college and gets a job, the wife and I will be looking for some land and a house in the country-----------then I can have my chickens. With 35 chickens, you won't have a shortage of eggs once they start laying. We also got a chick waterer and feeder and chick starter and growth forumula feed. seamed a little small to put out side. any how any advice would be appreciated. Hang in there you will make it out of the city. We hope to sell some of the eggs. Thank you, and are those baby rabbits? 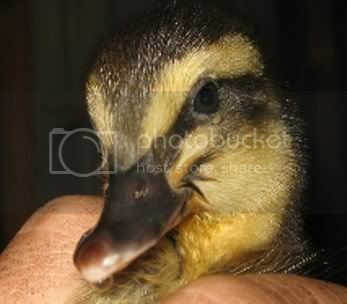 My Thumper is due Sunday .I wish I could have ducks. I can hardly wait, it will be fun being moma hen. Well seams like chicks are in season.. I think they are. It's spring! A time of rebirth and new growth. Yes, Rabbits. New Zealand x California cross. You can have ducks. Muscovies don't quack, they whisper. No place for the ducks to get their feet wet, they would run away to the river. small childs pool. and they know where the feed is.